← Ticket the lane blockers! For many bicyclists, Copenhagen is Shangri-La — a place where the world is ordered as they figure it should be. It’s a place where nearly everyone rides a bike, where bike lanes are on a par with auto lanes, where more than half the city’s adult population commutes to work by bike every day, where cars are a secondary means of transportation. Copenhagen has long been a model for U.S. cycling advocates trying to make their own cities more bicycle-friendly. Some American cities are just now coming to the realization that more roads, more lanes and more cars are not the solution to traffic congestion. And a few have taken the lead — Minneapolis, Portland, Ore., and Boulder, Colo., for example. But in Copenhagen that realization came much earlier. Over the past five decades, Copenhagen has become “so good at making this city bicycle-friendly, it’s given the world a new word: Copenhagenization,” says the CNN reporter as he zips along on his bike. A friend who lived for a time in Copenhagen and has a son who was born there posted the CNN video on Facebook and suggested it be required viewing in Arlington, a city sandwiched between Fort Worth and Dallas. Arlington proposed an ambitious plan to reduce traffic lanes on some thoroughfares and add bike lanes, but it has scaled back the plan in the face of a vocal opposition. The next in a series of public hearings on the plan is expected to be held June 14. The opponents argue that bike lanes will slow down traffic, eat up parking spots for local businesses and make driving more dangerous because of an expected increase in the number of cyclists. There’s even a strain of thought that adopting any idea from Europe — whether it be about bike lanes, public transportation, healthcare or creation of neighborhoods where shops, services, schools and restaurants are a short walk or a bike ride away — will put the United States on a slippery slope to socialism. Arlington, by the way, has a population of about 375,000 and is home to the Dallas Cowboys’ stadium, the Texas Rangers baseball team and a large campus of the University of Texas. But it was described by The New York Times in a story about this year’s Super Bowl XLV as a “drab, featureless city a little closer to Fort Worth than to Dallas.” And, it has the dubious distinction of being the largest city in the United States without any public transportation. Some U.S. cities have made a good start and others, like Arlington, are trying to become more bicycle-friendly. 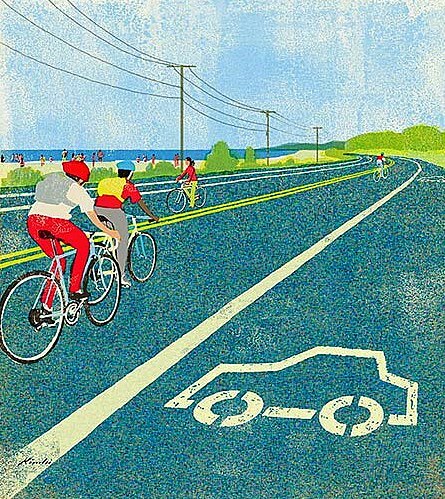 But, sadly, car-centric America has a long way to go to becoming a cycling Shangri-La. Click on the link below to view the CNN report. Hi Jim. The push back against the move to promote bicycling in towns and cities is to be expected, but should be met with a better argument. The resistance could be greater cost, confusion over right-of-way, etc. But I read the debate this way: do you want a high standard of living, or a high quality of life? The standard of living crowd promotes quick access to things, so that they can move easily in their ever bigger vehicle. The quality of life crowd suggests that there is pleasure to be had in riding and fresh air. I moved from Florida to Germany because I value quality of life over standard of living. Sure, we have our share of cars, but they are clean and bicycle access is everywhere.